Where do you turn when you need graphic design services like print, animation or illustration? Maybe you’re a small business in need of a brand identity for a new product, or maybe you’re a video production company with a need for animated titles for a video. The available options usually include doing it yourself, hiring a freelance designer, or hiring a design or advertising agency. As a freelance graphic artist myself, I would like to highlight a few of the advantages we freelancers can offer the seekers of our services. First, I think it goes without saying that a solo freelancer will not fit the bill for every scenario. A large company in need of a broad range of design and marketing will usually require the help of a big, full-service agency. Truth be told, the right solution depends on the size and scope of the projects at hand. I myself wouldn’t want to be too ambitious by taking on a project that I couldn’t complete on time or deliver what’s expected. I believe the best things a freelancer can offer is flexibility in several areas and a personal devotion to the work they take on. 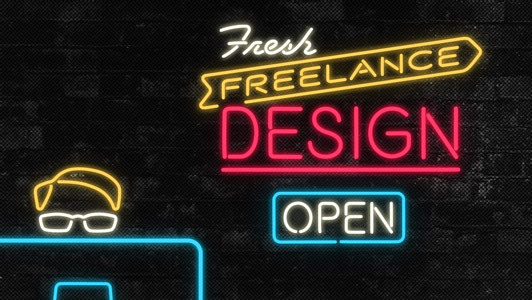 Freelancers can be a budget-friendly solution when you don’t have an in-house a designer or when big ad agencies are out of reach. Experienced designers and small design companies typically have prices and rates that fall in the middle of the scale, while large agencies are towards the top of it. I know I’m not the lowest nor the highest-priced guy out there. Those shopping around for design should find a variety of quoted prices as designers have different levels of experience, capabilities or demand for their services. Of course, one shouldn’t choose solely on price. There is a world of online auction and contest websites, where people work for very little or free. Those may serve a purpose when people need a quick and easy logo, but I don’t recommend it most of the time. You’re likely to find people with less experience and less design sense, churning out ideas formed with little knowledge of the company or product. This can be a gamble, so I stress the importance of finding an experienced designer who has worked with clients similar to yourself. Like most things, you get what you pay for, so please consider the value the design offers in the long term. Today, it’s easier than ever for anyone to get their hands on the current software tools used for design. It can be tempting for someone to take a stab at creating their own marketing items. Some may be genuinely proficient in the software—with an understanding of the technical side and they take up design as a kind of side-job. I don’t fault people for wanting to learn or dabble in it. The question to ask is: does that person possess the skills and creative ability to conceive well-thought-out ideas executed into effective visual design? Will that person take the time to research and understand the problem? It’s necessary to find out a project’s goals, message, audience, and competition, before any concepts are drawn up. It’s worthwhile to seek the services of an experienced designer who will give your project the proper amount of time and professional attention for it be a success. It is in the designer’s interest to give good service. Every freelancer has their own way of operating, so I can only speak about what I myself strive for in terms of service. I try to be flexible with my time while working on a project. For example, putting in extra hours and weekends to get something done. I do my best to accommodate a last-minute meeting or take calls at odd hours. A plus of working with a solo designer is the personal attention you receive—it’s good to know you deal directly with them in emails and phone calls. Whenever possible, I do my best to anticipate problems, accommodate last minute changes and give a little extra. I think most good designers in the freelance community work by these policies as well. If it’s called for, I might enlist the help of other people to collaborate with on the project. Established designers usually have contacts from other disciplines to draw from like videographers, photographers and editors. Of course it’s a good idea for the client to check them out and discuss any additional costs before agreeing to it. Hiring a graphic artist is the start of a relationship and a level of trust has to be established. It may take some time to find out how both parties communicate and mesh together. It has to be the right fit. As in any business, a freelancer is an entrepreneur who aims for high-quality and the satisfaction of its customers. For myself, and the community of creatives I know that care for our craft, our goal is to deliver effective design and good results. Our reputations and livelihood depend on it.